Joni Newman of Just The Food and Celine Steen of Have Cake Will Travel have more tasty recipes on their blogs. Be sure to check out their amazing vegan cookbooks, especially The Complete Guide to Vegan Food Substitutions where this recipe comes from! Peas are good, but these peas are awesome. Serve as an alternative to mashed potatoes. . . Without any added fat! BRING BROTH to a boil. Reduce to a simmer. Add onion and garlic, cover, and cook over medium-low heat for 20 minutes, or until vegetables are soft and most of the liquid has been absorbed. Stir in horseradish, mustard, pepper, and peas. Heat through. Using a blender or food processor, purée until mostly smooth but still a little chunky. Add salt to taste. I used Cayenne pepper instead of horseradish and I think I could have done with extra onion, or maybe an onion and a Leek. May just try it next time with a little whole grain mustard stirred in, too. This looks delicious! Can’t wait to give it a try. This is pretty good. I added additional spicy brown mustard. Is good as a side or main dish for healthy vegan. I did not think the horseradish was overpowering at all. I think this recipe looks pretty good, but I’ll probably hold the horseradish. 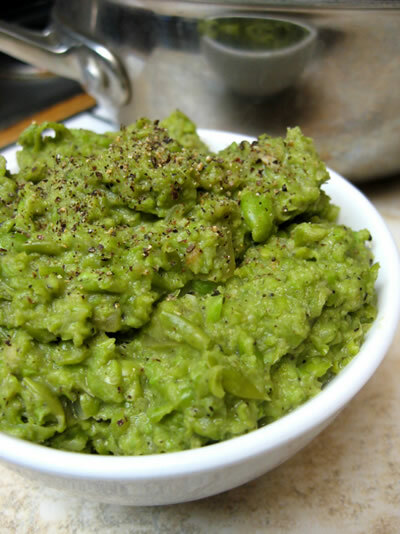 Will have to try this-love peas and usually just add pepper and mustard and devour! Wow- I loved the idea of this, but the horseradish was totally overpowering. My eyes were watering trying to eat it! I ended up rinsing the dish in a sieve and using the peas as a base in miso soup. If you aren’t big on major horseradish flavor, start with less than 2 T.
Sarah – you could use it as a side dish like you would mashed potatoes, but it would make a nice dip as well. How would you serve this? As a dip for an appetizer or a side dish with dinner? This looks so good I am going to give it a try soon.